Austell, GA – April 20, 2018 – FSI is committed to creating strong business alliances. We are always looking for ways to connect clients, prospects, vendors and our networks so everyone succeeds. Isn't that really what business is all about? For the past six months, FSI has been a proud sponsor of The Tiffany Krumins Show on Business RadioX. Tiffany is a brilliant entrepreneur, inventor, busy mom, cancer survivor and the first ever winner of Shark Tank, which aired in 2009. On Shark Tank, Tiffany struck a deal with Barbara Corcoran for $50,000 to launch her product, Ava the Elephant, a medicine dropper that talks and soothes children who may not easily take meds by mouth. Fast forward to 2018, Tiffany has licensed her Ava product and is also working on a new product launch. She began the radio show with Business RadioX to help other entreprenuers, inventors, and emerging businesses succeed. Tiffany is often approached on social media and at events with questions about her experiences. There are many learnings from what she has experienced by being plunged into the world of product development and distribution with Shark Tank backing. What is a UPC code? Who does your pick/pack/ship? Do you know of a good web site developer for a shopping cart? When and how do I patent my product? How does EDI work, I have large retailers wanting to carry my brand? What a great fit for FSI to work together with Tiffany as our company's objectives of creating business relationships met head-on in late 2017! 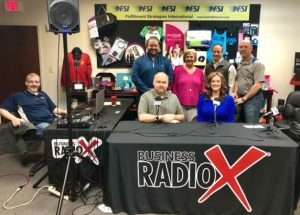 As a celebration of the first six months of our partnership with Tiffany's show and Business RadioX, FSI hosted a networking event on April 20th, LIVE@FSI. The LIVE@FSI event was the perfect way for our clients, vendors, friends and team members to network, talk shop and meet business leaders who all share common goals and challenges. Tiffany was joined at the event by Steven Julian, mild mannered Investment Manager by day and on Fridays, Steven is the "slightly annoying" (his words, not mine- LOL) co-host of The Tiffany Krumins show on Business RadioX. 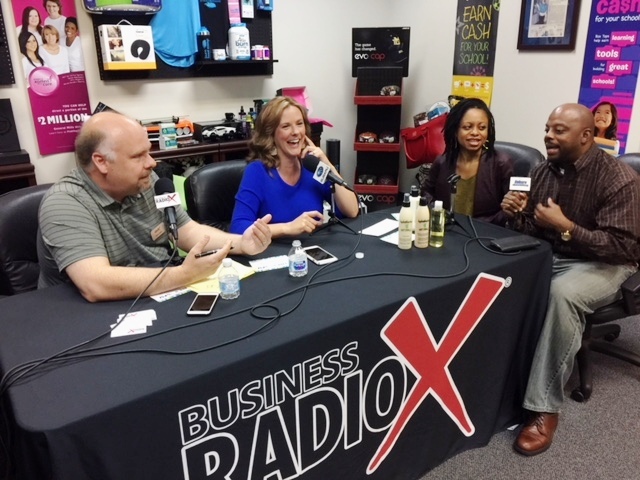 Steven and Tiffany and the wonderful producer/crew team of Business RadioX set up studio at FSI and held interviews with our clients and guests. Off the air, the crowd enjoyed a lot of good food and took time to really get to know each other. Everyone had such a great time that FSIis planning to make LIVE@FSI a recurring event! Many of FSI's clients got in on the fun including Healthy Hair Journey, shown above during their interview with Tiffany and Steven. The guys from Goodwipes were also on hand for a high energy update as well as one of our newest clients, Putter Pong! We want to thank everyone who came out to this new event and we can't wait to plan the next one. Making connections, growing relationships, learning about other businesses, sharing knowledge and having a great time...hope we see you at the next LIVE@FSI! Be sure to look for the re-launch of Ava the Elephant coming later this year!